Very comfortable and very functional villa located in a residential subdivision. Quiet assuré.La villa has two covered terraces (north and south) to enjoy the environment and take meals outside in all seasons, while protected in case of hot weather. The covered terrace overlooking the pool has a kitchen area and equipped with a plancha. The 12x6 with infinity pool overlooks a wooded area and visually protected from prying eyes by a mimosa hedge. This recreation area is surrounded by a large terrace to enjoy the benefits of the sun and spend some quality time with family or friends. the pool is secure (two alarms) and accessible to swimmers as non swimmers due to its gradual slope. It has a wide staircase access. Minimum Depth: 1.20 m and maximum 2,20 m. this area enjoys maximum sunlight. Furthermore, you have at your disposal an outdoor shower and sink with hot and cold water. The villa can accommodate three passenger vehicles parked inside the property (including one in garage) and has two outdoor parking spaces. The first necessity shops (bakery, tobacco / press, discounter) is less than 5 minutes by car. The hypermarket Leclerc to 10 minutes. Near this large area is the Olympic pool of Saint Raphael. Golf is also 10 minutes from the villa by car and 20 minutes, you immerse yourself in the Esterel mountains for lovers of nature and hiking. The beach of Saint-Raphael (city center) is 15 minutes by car. The city has a beautiful cinema complex (near the station) and every night during the summer, you can explore the open-air market with many artisans, located by the sea. The villa has a Internet connection. The villa has a bathroom upstairs: shower and 2 sinks + an outdoor shower hot water, cold water and a basin. 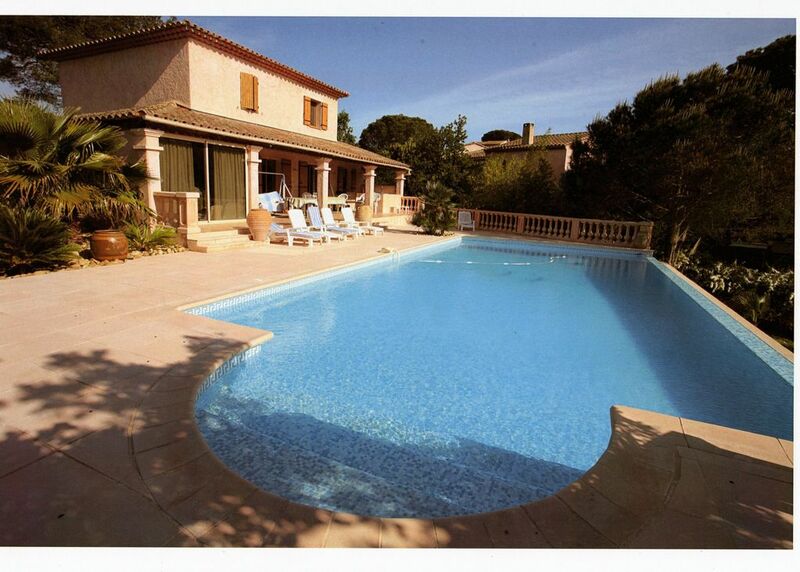 This is a charming 3 bedroom villa with plenty of character and a fantastic pool. There was plenty of space inside and out in a quiet area to have a really relaxing week. There was all the amenities we needed and we were made very welcome by the hosts. The villa is in an ideal location to visit the town of St Raphael (10 mins dirve) or Fréjus (15 mins drive) or Agay (also 15 mins drive). There were plenty of supermarket options close by with a short drive. Everything was there for a perfect week, booking was easy and the communication with the owner was excellent throughout. Would thoroughly recommend. The villa and especially he huge pool were lovely as was the location. Convenient for shopping, etc. The villa was absolutely perfect for us, everything we needed was there and very comfortable beds. The pool was amazing, so big , we spent such a lot of time in there, lovely! The location was also lovely very quiet but near local shops and also St, Raphael, all only a very short drive away. We loved this property and the area and would definitely like to return again in the future. Also the owner was extremely helpful and ensured everything was OK for us. We would thoroughly recommend this property. Propriété conforme au descriptif et aux photos. Très bien située au calme sur les hauteurs de Saint-Raphaël et à 5 min. du bord de mer. Très belle et grande piscine à débordement, le vrai plus de ce bien. A recommander. A wonderful villa with a beautiful pool in a nice garden. The house was very clean and the kitchen well-equipped. A very home-like holiday house. We and our children enjoyed our vacation at your house. Das Haus liegt in einem ruhigen Wohngebiet am Ende einer Sackgasse, der Ortskern und Einkaufsmöglichkeiten sind mit dem Auto sehr schnell zu erreichen. La maison etait propre. La douche à l'extérieur est très bien. La piscine est fort agréable, surtout le soir avec son éclairage qui l'embellie. Dommage que les draps et serviettes ne soient pas fournis, il faut dire que ca prend de la place dans une voiture. À part ca les chambres sont spacieuses et il y a des moustiquaires à chaque fenêtre, heureusement. Je recommande cet endroit (n'oubliez pas votre prise anti-moustiques)!